Scarlett Ray-Marie Burroughs, infant daughter of Rachel Yahne and Clinton Burroughs was born on March 7, 2018 in Muskegon, MI. She passed away Saturday, November 17, 2018. 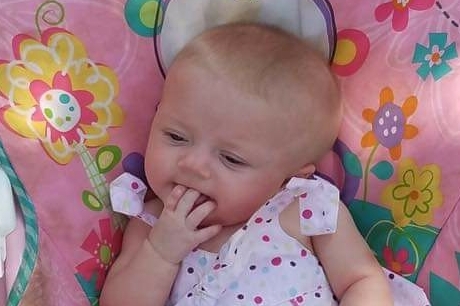 In addition to her parents, Scarlett is survived by her sister, Isabella Harrell; brothers, Jacob and Travis Harrell; grandparents, Dean (Ronda) Scharphorn, Tammi (Nelson) Anderson, Clinton (Lisa) Burroughs Sr., Ronald (Shantelle) Yahne; great-grandparents, Sandra (Glenn) Buckner, Bob (Shirley) Scharphorn, Warren (Joyce) Anderson, and Donnelda Genson. A Celebration of Life for Scarlett will be on Friday, November 30, 2018, from 2:00 p.m. to 6:00 p.m. at Crockery Township Hall, 17431 112th Ave, Nunica, MI 49448. A Go Fund Me Account has been set up at https://www.gofundme.com/6fgg914 to make donations.